The skin care industry has shown significant growth in the last few decades. A sheet face mask is an innovative product that has been introduced in the market in the recent past. It is a face-shaped sheet that is soaked with different serums and formulations to achieve a desired end result. Masks are usually packed individually and are applied to the face, patted, and removed or peeled off after15-20 minutes. A rise in population and increase in demand for beauty and cosmetics products are boosting the sheet face masks market globally. Increase in the use of sheet face masks with skin brightening and anti-aging formulations is expected to propel the market in the coming years. The sheet face mask market has been segmented based on type, category, distribution channel, and region. In terms of type, the market has been classified into non-woven, cotton, hydrogel, bio-cellulose, and others such as ecoderma, pulp. Etc. Based on category, the sheet face mask market has been bifurcated into premium sheet face masks and mass sheet face masks. In terms of distribution channel, the sheet face mask market has been categorized into online and offline. The offline channel has been further divided into large stores, drug stores & pharmacies, specialty stores, and individual retailers. Based on region, the market has been segmented into North America, Europe, Asia Pacific, Middle East & Africa, and South America. Demand for sheet face masks in the region is high due to a rise in the standards of living, increase in skin care awareness, adverse climatic conditions, and high air pollution rate. The global sheet face mask market is estimated to expand at a significant growth rate between 2018 and 2026, due to increase in emphasis on product development by manufacturers. Consumers are paying greater attention to their skin and have also become beauty conscious. Moreover, an increase in the number of working women has driven demand for sheet face masks. Use of sheet masks has also rise among male consumers. This, in turn, is prompting manufacturers to develop and innovate more products with promotional offers in order to satisfy consumer demand. In terms of type, the bio-cellulose segment is projected to expand at a rapid pace, due increase in awareness about the usage of chemical-free and organic products. The segment is likely to be followed by the hydrogel segment. Hydrogel sheet masks offer a number of benefits such as hydration, whitening, and glow. Market players are focusing on the manufacturing of sheet face masks at cost competitive costs. Consumers have shown an increased preference for anti-ageing formulas and dehydrated skin treatment. The impact of this driver is estimated to be medium in the short run and high during the forecast period. Moreover, increase in aging-related skin problems, problems with dry skin, especially in winter, and changes in lifestyle patterns are boosting the usage of sheet face masks. Sheet face masks are gaining traction among the aging population across the globe. Rise in demand for sheet face masks with anti-aging formulations among the elderly is likely to propel the sheet face masks market in the coming years. Major market participants profiled in this report are Sephora Inc. Boss Biological Technique Ltd.., Lancome Paris, 3Lab Inc, Kracie Holdings, Ltd., Innisfree Corporation. (South Korea), BioRepublic Skin Care, Star Skin Beauty Group AG, Yunos Co. Ltd. Es Cosmetics, The Face Shop, Tonymoly Co. Ltd., BioRepublic Skin Care, Estee Lauder, and DECLÉOR Paris among others. The sheet face mask report provides analysis for the period 2016 to 2026, wherein the period from 2018 to 2026 is the forecast period and 2017 is the base year. The report covers all the major trends and technologies playing a key role in the expansion of the sheet face mask market over the forecast period. It also highlights the drivers, restraints, and opportunities expected to influence the market’s growth during the said period. 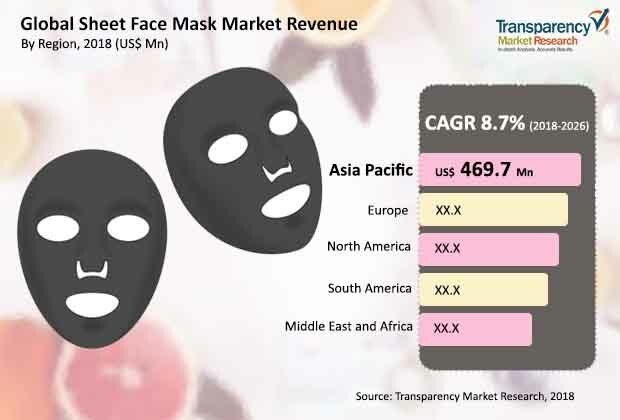 The study provides a holistic perspective on the sheet face mask market growth throughout the above mentioned forecast period in terms of revenue and volume (in US$ Mn and million units), across different geographies, including Asia Pacific, South America, North America, Europe, and Middle East & Africa. The market in North America has been divided into the U.S., Canada, and Rest of North America. Similarly, the market in Europe has been classified into the U.K., Germany, France, Italy, and Rest of Europe. Asia Pacific has been segmented into China, Thailand, Indonesia, Malaysia, New Zealand, Australia, South Korea, Singapore, and Rest of Asia Pacific. The Middle East & Africa covers the GCC, South Africa, and Rest of Middle East & Africa. Similarly, the South America region includes Brazil and Rest of South America. This report provides all the essential information required to understand sheet face masks and their types. Furthermore, Porter’s Five Forces analysis explains the factors that are currently affecting the sheet face mask market. This report also provides the value chain analysis for the sheet face mask market, which explains the participants of the value chain. Key players in the global sheet face mask market profiled in this study include The Face Shop, DECLÉOR Paris, Yunos Co. Ltd., STARSKIN, 3Lab Inc, Lancome Paris, Estee Lauder, Kracie Holdings Ltd., Bio Natural Inc., It’s Skin, Tonmoly Co. Ltd., Innisfree Corporation, Boss Biological Technique Ltd., and Sephora Inc.. Details such as business strategies, recent developments, product ingredients, and other such strategic information pertaining to these players have been duly provided as part of company profiling.